Today, in a special Teaching and Learning briefing, the members of the Teaching and Learning Team introduced themselves and their roles for the year. Read on to find out more about the various foci of the team, and how Beaumont staff can get more involved with T&L. To share and demonstrate ideas on how mobile devices and ‘new technologies’ can be used to enhance and extend Teaching and Learning at Beaumont. Create a document/booklet containing examples of apps, websites and platforms, categorised according to the following key areas of Teaching and Learning: feedback, assessment, revision, differentiation and collaboration and communication. Ideas have been (and hopefully will continue to be) submitted by a wide range of Beaumont staff. Seek feedback from departments with regards to which apps, websites and platforms they wish to utilise/learn more about. Find time in department meetings and/or INSET to demonstrate and provided training. Explore the use of Google Apps for Education, including Google Classroom (with James Goddard). Google Classroom serves as a platform for teachers to create and organise assignments quickly, provide feedback efficiently and easily communicate with their classes. Works alongside Google’s popular suite of productivity and storage applications. Set up a working group to test and feedback on the effectiveness of Google Apps for Education and Google Classroom. This is currently in its early stages of testing – more details will follow on how and why to get involved. To form a working party to experiment with new ideas, and then share their experience with colleagues and the wider teaching community. The group will draw on various resources e.g. T&L library, colleagues to get new ideas, and use them within lesson where appropriate once every term. Following the trial of the new ideas, members of staff will be asked to write a review (in which they should provide some context of the lesson and group) which can be shared via the T&L blog, Bring and Buys, resource board and possibly through Heads of Subject. Development and research of new strategies to encourage students’ higher-level thinking, and to challenge them in the classroom. To provide resources, ideas and support for Beaumont teachers to allow them to implement new strategies in the classroom and in lesson planning, with the main aim being to support students in gaining a better understanding of how they learn. Meet with a group of teachers, across a range of subjects, to introduce ideas and feedback from students so far, with the aim for Beaumont teachers to then trial their preferred ideas in the classroom. Meeting: 5/10/15 in Lab 42. During the course of the year I will email those teachers who attended the above meeting with resources, new things to trial out and to check in and see how things are going. During the year there will be a following two meetings in the Spring term and Two in the summer term. This will provide an opportunity for the group to discuss and share successes and failures. There will also be opportunities during the year for the group to observe one another; this will allow teachers to see how strategies are implemented differently in different classrooms. I hope that collectively during the course of the year we will collate resources and ideas, and make improvements to these strategies in order to share them with the rest of the staff. To examine and apply various time-saving marking strategies to try and reduce workload of marking, whilst still providing enough feedback for students to progress. Trial various marking and assessment strategies with my own classes to examine any advantages or disadvantages. 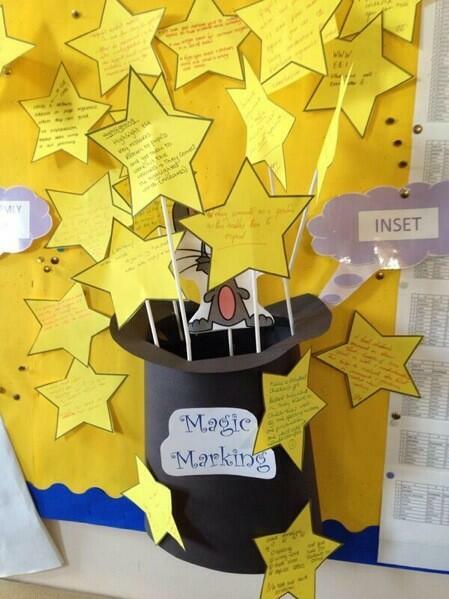 Look at examples of marking from other departments to examine what works best for specific subjects. Departments will be contacted about this in the coming weeks. Provide ideas and advice at the November INSET to help staff to find a system that will work for them and which fits around their schedule. Collect feedback and opinions from a variety of staff and subjects to help advance these ideas throughout the year. For all students to be able to understand and work with numbers in any subject. They should recognise when it is necessary or appropriate to use their numeracy skills and be able to apply these skills in various contexts outside of the Maths classroom. Working initially with the Science, Geography and PE departments. Heads of Department have already been contacted. Looking at areas on SOWs which already involve numeracy and examining how/when these topics are taught – are they consistent with maths lessons? Attending department meetings for these subjects to discuss teaching methods and consistency with methods and keywords. Running Maths Week activities as last year. To get involved, please speak to the member of the team responsible for each focus. With reports of teachers spending 60 hours a week working, there is always a need to consider how we can make life just a little bit easier. However many teachers quite rightly feel that time marking pupils’ work is simply one area which cannot be eaten in to – there is just no substitute for the feedback which pupils receive from properly marked work. Our Teaching & Learning INSET focused on ideas that might help staff find ways to reduce the time spent marking, but without losing the quality of feedback which pupils receive. We wanted to look at how we could help students progress with effective and timely feedback and think about whether we are giving pupils the information and time they need to reflect and understand how they can improve in the future. As usual, in our small working groups, staff discussed what they currently do, their concerns and problems, and we shared ideas and tried to support each other in finding ways to reduce time but increase the impact of our marking strategies. 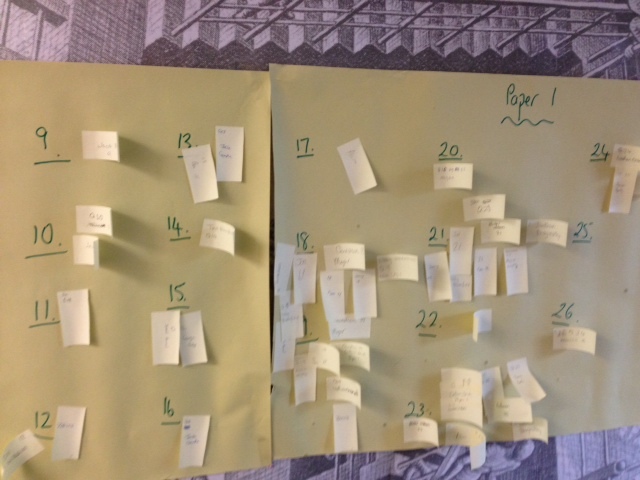 We started by marking a piece of work individually and then looking at the ways we had approached this. Did we take the same amount of time? Did we find the criteria for marking helpful? What are we looking for when we mark? how long did it take and could we reduce the time taken? Thanks to @Listerkev, Helen Wilson and Sarah Lofthouse have been trialling a system known as RAG123, where books are marked much more often (every lesson in an ideal world) and pupils take part in the marking by assessing both their effort and understanding. This powerpoint was discussed in the INSET, but there is lots more detail in this blog post (and the related links within it) from @ListerKev and on twitter using the hashtag #RAG123. The powerpoint used in our INSET also includes quotes from our own pupils when feedback was discussed by the student voice group. Some staff (eg Fiona Pinkerton in Science) use the idea of “Praises and Raises” codes – pupils receive a code in their book which they can then relate to a list of strengths and targets and find their specific feedback. There was a great deal of discussion about how the different ideas could be applied to various subjects and many staff thought about particular adaptions that they would make to a variety of ideas raised. Moving onto the feedback we give to pupils, staff were asked to brainstorm about what would be totally ineffective and unhelpful feedback. We then looked at how we could address these issues. Examples included making feedback in a timely fashion and allowing pupils sufficient time to act on targets given. 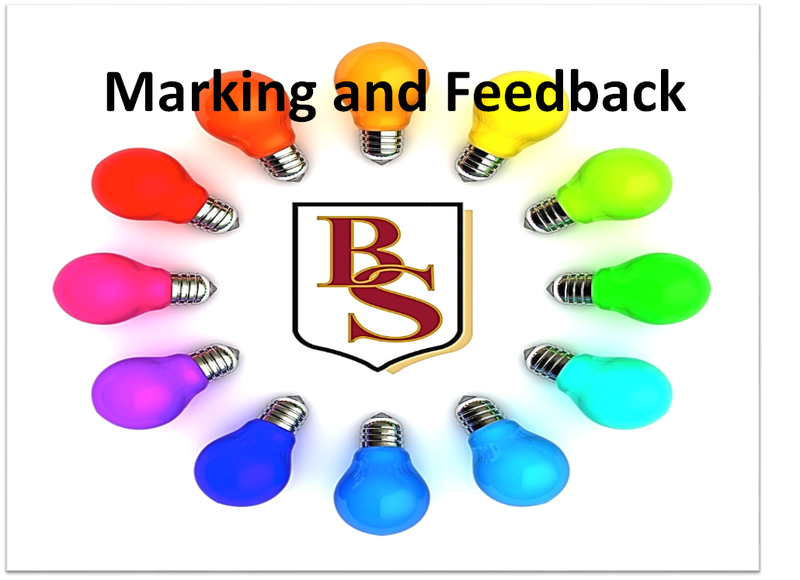 Through our student voice group, we also had thought from pupils about what was helpful to them when receiving feedback through marking – these ideas can be seen on the Power point. A sheet of ideas about reducing marking workload was given to staff before they were asked to give some feedback to the T&L team on the INSETs run this year and also add their own ideas to some “Magic Marking” stars (some of these are already on the staff noticeboard, others will appear on the blog in a later post, in the T&L newsletter and on more cards for the black boxes). Marking and feedback are a continual source of discussion among teachers, and there no real “right” answers. There are other ideas to read from Belmont Teach in this article. Hopefully you will find something in all of this to try for yourself – if you do, and you want to share you adaptations with us, please get in contact via twitter or email. On the back of our very successful TeachMeet in November 2013, I was asked to present at Bentley Wood’s Teachmeet on the 16th January on our “Washing Line of Ideas”. The presentation was to last up to 2 minutes – a pretty tall order when there were so many ideas to share. On arrival at Bentley Wood I was very impressed with the set up, particularly when I discovered that every delegate received a goodie bag! The presentations over the course of the evening were fantastic, ranging from “The Power of Film Club” to “Dispelling the Myths of TeachFirst”. Particular highlights for me were presentations by James Davies and Sarah Robertson from Hertswood Academy. Sarah presented on independent learning strategies, essentially C3B4ME (see 3 before me). Students were shown talking about how they could improve their work with very little input from the teacher, which was very impressive. 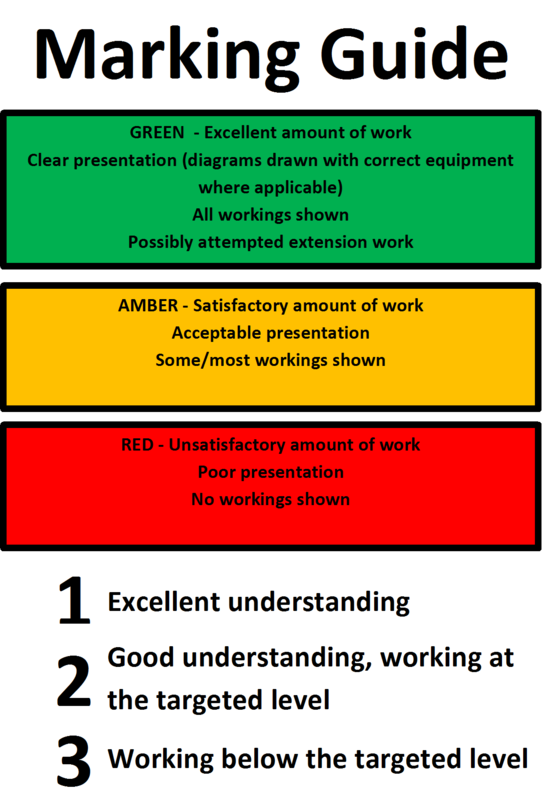 James talked about Hertswood’s peer assessment strategy, which is currently aimed at year 7. 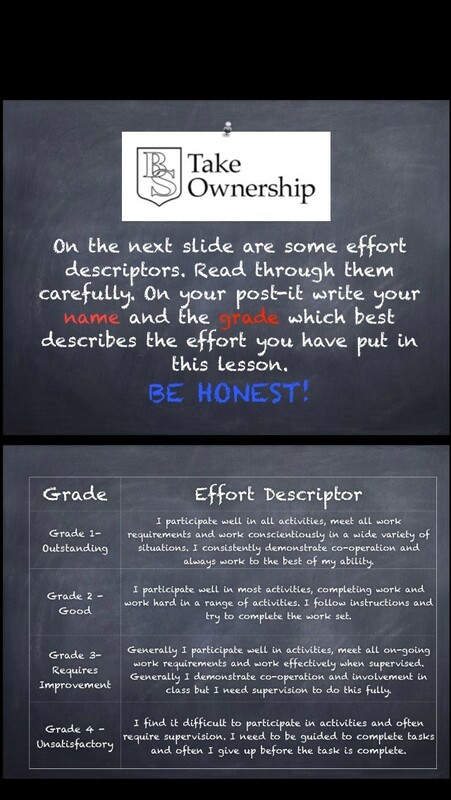 The idea that got me particularly excited was their use of effort descriptors, where students self-assess using outstanding to unsatisfactory criteria. I was so struck by this idea that, after getting home quite late, I devised some of my own descriptors to be used with my year 9 class the following day. It worked brilliantly and I loved the fact that the students were so honest about their performance. I will definitely use them again. 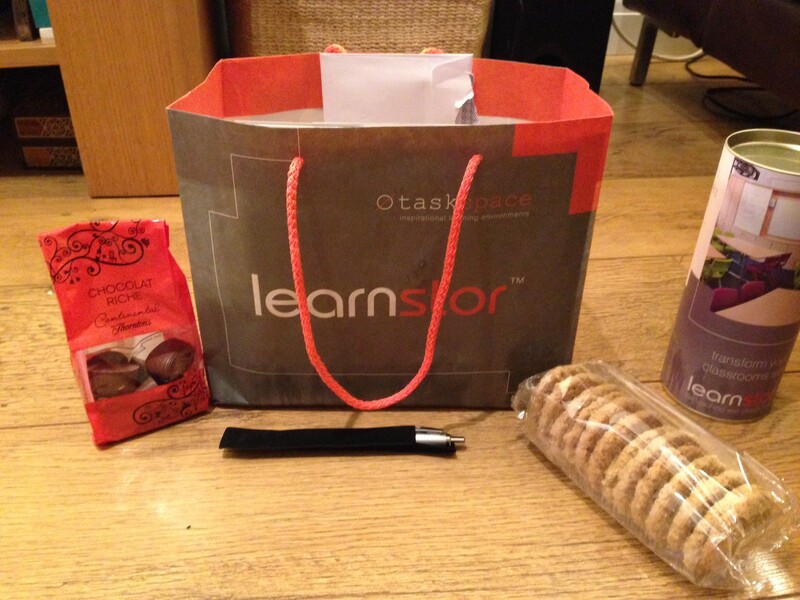 Attending the TeachMeet got me excited about teaching all over again. At a time when it seems that every day brings new pressures, it is nice to get back to basics and talk about teaching and learning with colleagues. 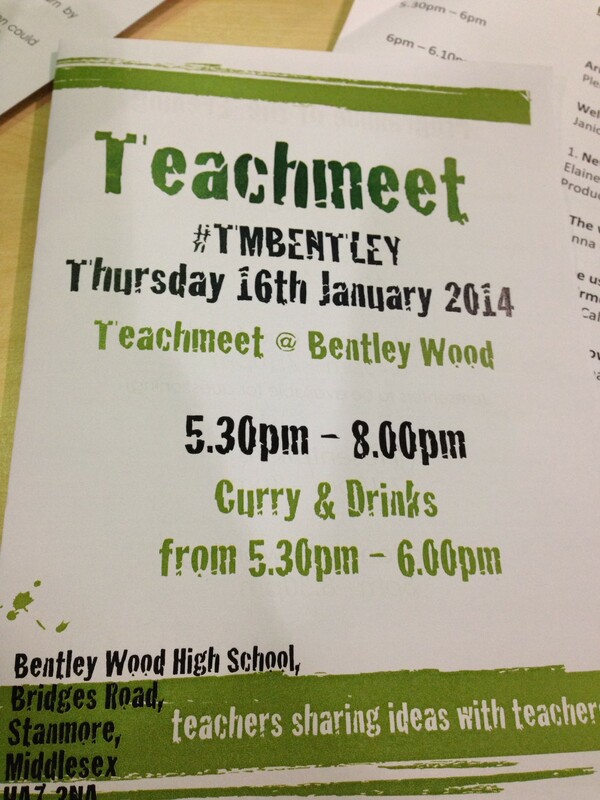 Bring on Beaumont’s second TeachMeet on the 10th July! One type of lesson which necessarily has to take place, but which deep down, until recently, I would dread, is the “Here is the test/exam paper you recently sat, and your results” lesson. It seemed that no matter what I tried, these lessons always seemed to go one of two ways – either I would spend a great deal of time talking at the front of the class, trying to highlight where mistakes had been made and what ideal solutions for questions would look like; or the lesson would result in me feeling dragged from pillar to post, as student after student wanted me to look through a particular question with them and discuss what they needed to do to improve their score. Invariably, there would always be a number of pupils who would use the lesson to check and double check and, yes often, triple check my allocation of marks and adding up, in the hope that they would find an extra mark and feel good because they had done so. This seemed to serve no sensible purpose at all, and I would leave the lessons wondering how I could make them actually look at the paper to find areas where they needed to practise their skills further, or even better, start coaching each other in how to improve their scores on the test. Luckily, through my trusty twitter feed, I came across this fabulous article by @TheMathsMagpie which explained a great collaborative activity for reviewing exam papers, called Ask the Expert. I have used the activity 3 times now, and each time have been astonished by the amazing amount of intense activity generated – pupils genuinely trying to coach each other in how to improve their score in order to reach their target grade. 1. I did give pupils the grade boundaries and asked them to calculate how many marks they would need in order to reach their target grade – for those who were already there, they had to calculate how many more marks they would need to exceed their target. 2. I didn’t give pupils a long grid to complete, simply 3 pieces of post-it notes on which they had to write down their name and a question on which they achieved full marks. 3. They then had to use the chart created at the front of the room to find an expert to ask to help them get closer towards their target. I emphasised the need to coach each other – it should not be just one pupil teaching the other but a collaborative effort to increase the marks of all pupils in the class. Although the system seems complicated on first reading, it really does run like a dream, even engaging the pupils usually most reluctant to work with their peers in seeking support. It gives a very specific task to do – getting the marks to reach (or exceed) your target. Each time I have run the lesson, I have had time to focus on pupils who perhaps needed some specific guidance or support, and yet have seen all pupils completely engaged and not spending a lesson surreptitously checking the adding up of marks for a fourth time. Thank you to @TheMathsMagpie for another winner idea – saving me from dreading test paper return days.